We've heard rumors, DLNA certification, and we've seen a benchmark test, but until now we haven't had any real confirmation directly from Samsung that there would someday be a Samsung Galaxy S4 variant that was powered by the Qualcomm Snapdragon 800. 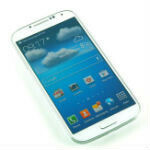 Today, a Galaxy S4 user manual of all things has confirmed that there is such a device on the way. First of all: who actually knew that smartphones still had user manuals? If you say you did, we'll call you a liar. User manuals are a fabled thing that you assume exist, but you've never seen one. But, here we have it, a manual for the SHV-E330S model of S4, which is presumed to be a model bound for South Korea with LTE-Advanced inside. The manual also confirms that this variant of the S4 has a Qualcomm Snapdragon 800 (MSM8974) inside, which supports the faster LTE standard, and of course has been pretty impressive on benchmarks. We'll have to see if the benchmarks translate to real world differences though. How many versions of the S4 are they going to make? They're making the same mistake HTC made. Yep, samsung is dominating just about everybody around the world, and has the 95% plus profits in android. They certainly are making huge mistakes. I wonder what would happen if they started doing things right? There are just too many versions and variants of S4 that it is not easy to be ignored. Somehow, they are diluting the sales of the original S4 flagship. And it's not always a good thing when there are more versions than you can actually name and set apart. Just two, if they have to...just two versions is quite enough. They already pass the stage of doing the 'right' thing. "They already pass the stage of doing the 'right' thing." What makes you think they passed this stage(other than your opinion)? S4 is and will be the best selling android phone this year. Other samsung phones are selling more than all the others. I remember people saying the same thing about phone sizes, and we all know how that turned out. Besides, making different phones and giving them different names is more of HTC thing. Such a FANBOY, you don't need to defend you're favorite brand..
Whatever that goes up must come down. Just wait and see, Samsung will also fall in the future if they stick to this kind of strategy. i think samsung is purposely taking a risk and knowingly wanting to waste money by making these other phone under same S4 name. They just want to create their brand "S" series name know. and they are actually ruining it. people from s2 times would remember it being the badass phone but now its about commercialization more than wanting to fill consumer needs. Say something positive about Samsung. I dare you. Subsidizing companies helps keep domestic jobs. Would be even nicer to be a consumer in Japan! Welp, my brother who got an S4 literally a few weeks ago will not be happy being made irrelevant in just a few weeks. If a smartphone makes your brother relevant then he deserves to feel crap about some Korean version having 20% more performance. There was a typo, or rather I missed a word or two. I meant the phone being overshadowed in power and capability so quickly. But thats how it goes in a new, hot market. But were it the case it wouldn't be all that different than anyone else. Some hipsters would claim that "my possessions don't make me" but really thats how society is, including most people. People feel bad when they buy some trendy gadget, clothing, etc. and have it dismissed all too quickly. Yes, generally many people act in that shallow way even if subtly. But of course I'm sure someone here is gonna get on a soapbox and tell me all about how they reached equilibrium and they're better than everyone. Also since I'm sure that someone will say I'm substituting my brother for me, yeah I do have an s4, we both got it around the same time. My only beef with it is some UI stutter that shouldn't really be there. That's about it. samsung thought iphone as its only competetor , now seeing htc design, sony waterproof huawei mega screen and nokia eos camera it is verymuch insecure... wants to break into each by launching different products..ina hurry attempt it has failed to see the pricetag of its own device.. what a pity lg is eating into it... just imagine s4 with 20mp cam, water and shatter proof build , 3 years warrenty , 2.1 speakers,4200mah battery.. samsung could have sacrificed thiness as a feature and added these..it wod have been master piece and crown for next 3 years... samsung wasted an oppertunity. this is when samsung is going down.